I am greatly saddened by the death of Chuck Colson this past weekend. I have always been grateful to Chuck for his kindness toward me. I was a part-time research fellow and a full-time mother when he began talking about my first book, “Love and Economics.” There was absolutely nothing for him to gain by being nice to me. But he featured my work on Breakpoint, and invited me to events, while I still had children under foot. As my children got older and I could do more, he just kept inviting me and including me and saying nice things about my work. The last time I talked with him was on the radio interview with John Stonestreet, featured as one of this week’s podcast. I was to be one of the speakers at the Wilberforce Weekend which Chuck had organized for the last weekend of March. This interview was designed to encourage people to attend. As it turned out, this was to be Chuck’s last event on earth. My daughter and I were in the audience when he collapsed at the podium. I was in a daze, or perhaps in denial. I kept thinking I would still have the chance to introduce my daughter to him. I couldn’t absorb the idea that this man who seemed so intellectually alive, might actually die. I guess that is one of the hazards of long-distance friendships: his physical decline wasn’t real to me, even when I saw him being wheeled out of the conference. “Oh, he will be ok, I am sure. I was just talking with him a few weeks ago. He was fine.” It was the weekend before Easter. Chuck spent that last Easter in the hospital instead of in prison. He had spent most every Easter in prison since his conversion. He loved celebrating the Resurrection of Christ with prisoners. Chuck will be remembered for his pastoral work to prisoners, a great corporal work of mercy, and a great demonstration of the transformative power of the Gospel. He will be remembered for the cultural work of the Wilberforce Forum, the Centurions Program and all the other ways he empowered the Body of Christ to become actively engaged in building up the Kingdom. He will be remembered for his ecumenical work in bringing Evangelicals and Catholics together. He will be remembered for his advocacy work as one of the co-authors of the Manhattan Declaration, a document that became a rallying cry for the defense of life, marriage and religious liberty. It is too soon to judge the ultimate power of his contributions in all these areas, because the ideas he put in motion and the institutions he put in place have not fully played themselves out. I have no doubt at all that he will be remembered as one of the most important, even crucial cultural and religious figures of our time. 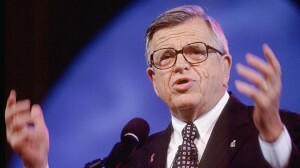 But perhaps even more importantly, Chuck Colson will be remembered for his conversion. Everyone loves a good conversion story. Since the time of St. Augustine, people have been endlessly fascinated by the vision of a life transformed by grace. Conversion is not entirely natural. We all want to think well of ourselves. When we do something wrong, most of us, most of the time, chose the path of least resistance: rationalization and self-justification. The most natural thing in the world is for us broken humans to double-down and defend ourselves in our sinfulness, laziness and just plain cussedness. When someone really turns around, say, from a convicted Watergate felon to a humble champion of Christ, well, that calls for an explanation. Even the most hardened atheist can see that something out of the ordinary has taken place. In a real conversion, Divine grace pierces the human armor. The supernatural breaks into the natural order. A hardened, selfish sinner allows himself to be changed. When conversion happens to us, we can only be grateful to be rescued from ourselves. We can all be grateful for Chuck Colson’s conversion and what it meant to the world.